Ecosystems of brackish, shallow water with salt-tolerant plants such as herbs, grasses or shrubs. They are usually found in the intertidal zones of sheltered marine and estuarine coastlines, in temperate and high latitudes. Saltmarshes, also called saltwater marshlands or saline marshes, are ecosystems located in the intertidal zone of sheltered marine and estuarine coastlines. The intertidal zone is the seashore area which is covered by water at high tide but exposed to the air at low tide. Saltmarshes are dominated by salt tolerant grasses, herbs and low shrubs. Saltmarshes tend to grow in areas exposed to relatively low energy waves, such as estuaries and tidal inlets. Saltmarshes develop where fine sediment has accumulated to an appropriate elevation and salt tolerant plants have colonised the surface. The roots of these colonisers help to stabilise the sediments and slow water flow, encouraging further deposition of sediment and stabilising the marsh surface 1. Saltmarshes are distributed on coastlines around the world, particularly in temperate and arctic regions. In tropical areas, saltmarshes tend to be replaced by mangroves, which grow in a similar zone of the seashore. The most extensive saltmarshes occur where there are large tidal ranges 2. Saltmarshes are of ecological importance as they underpin the estuarine food web. Saltmarshes serve as nesting, nursery and feeding grounds for numerous species of birds, fish, molluscs and crustaceans, including commercially important fish species such as herring (Clupea harengus) 3, 4. The shallow water and vegetation provides hiding places and abundant food for juvenile fish and various invertebrate species. Larger predators cannot enter these areas, making them a temporary safe haven while the fish have a chance to grow 5. Saltmarshes are also home to a number of Endangered and Critically Endangered species. An example of the unique and rare species found in this habitat includes the endangered saltmarsh harvest mouse (Reithrodontomys raviventris) 6, one of the few terrestrial mammals in the world able to drink seawater if fresh is not available 7. Saltmarshes are a particularly important breeding, foraging, overwintering and migration stop off points for many waterfowl species 2. Saltmarshes are also significant for human well-being and economies as they provide a range of ecosystem services, such as coastal defence, nutrient cycling, water filtration, immobilisation of pollutants and carbon sequestration 8. Saltmarshes are one of three key coastal ‘blue carbon’ habitats, recognised for their ability to store carbon within above- and below-ground biomass and sediments 9. 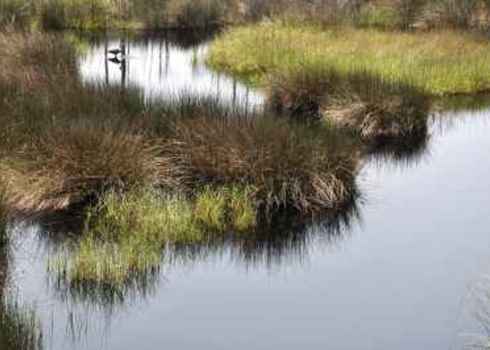 With an average annual carbon sequestration rate of 6 to 8 tonnes of carbon dioxide equivalent per hectare 10, saltmarshes sequester carbon at a rate two to four times greater than that recorded for mature tropical forests 11. Saltmarsh habitats are threatened by climate change-induced sea level rise as their capacity to migrate landward is often restricted by infrastructure, embankments or topography, resulting in loss due to “coastal squeeze” 4. Habitat loss is also driven by local-scale anthropogenic activities, such as drainage for agriculture and mosquito control, development of coastal infrastructure and ports, coastal ecosystem eutrophication, conversion to salt ponds, and infill for coastal development 8, 12. Despite providing essential ecosystem services, saltmarshes have not traditionally been a habitat of high priority for conservation and have lost between 25% and 50% of their global historical coverage 13, 14. The rate of loss is currently around 1-2% per year 15. Adam, P. Saltmarshes in a time of change. Environ. Conserv. 29, 39 – 61 (2002). Jones, L. et al. Coastal Margins. in UK Natlional Ecosystem Assessment Technical Report. 411–457 pp. UNEP-WCMC, Cambridge, UK. (2011). Hughes, R. G. Climate change and loss of saltmarshes: consequences for birds. Ibis (Lond. 1859). 146, 21–28 (2004). Segar, D. Introduction to Ocean Sciences. 563 pp. (Open source textbook, 2012). Haines, H. Salt tolerance and water requirements in the salt-marsh harvest mouse. Physiol. Zool. 37, 266–272 (1964). UNEP. Marine and coastal ecosystems and human wellbeing: a synthesis report based on the findings of the Millennium Ecosystem Assessment. 76 pp. (United Nations Environment Programme, 2006). Laffoley, D. & Grimsditch, G. (Eds). The Management of Natural Coastal Carbon Sinks. IUCN, Gland, Switzerland. 53 pp (2009). Deegan, L.A. et al. Coastal eutrophication as a driver of salt marsh loss. Nature 490, 388–92 (2012). Nellemann, C. et al. Blue carbon. A Rapid Response Assessment. Environment 80 pp. (United Nations Environment Programme and GRID-Arendal, 2009). Duarte, C. M., Dennison, W. C., Orth, R. J. W. & Carruthers, T. J. B. The Charisma of Coastal Ecosystems: Addressing the Imbalance. Estuaries and coasts 31, 233–238 (2008).